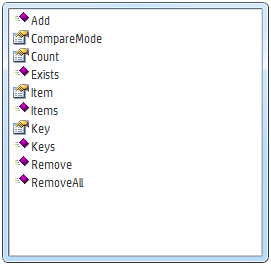 There are many ways to use Dictionary Objects but the most common use of Dictionary Object is to keep the value in an Array and refer each value with a unique Key or Index. Basically, Dictionary Object is nothing but an Array which contains values which are referred by unique keys. For each value in Dictionary Object, there is one unique key associated with value. Using Key name, we can call associated value anywhere in the script. This is the main difference between Array and Dictionary Object. An Array can have index value as numeric whereas in dictionary object, index value can be string. Hence while referring any value with key, a key can have any name associated with a value. Once you create Dictionary Object, there are many Dictionary Object Methods can be applied as per requirement in the script. Refer the screen shot given below for Methods of Dictionary Object and later we will discuss about all the Dictionary Object Methods in details. Add : Used to add new item in Dictionary Object. Exists: Verifies whether the key or value exists or not in the array. Items: Returns an Array with all the values in Dictionary. Keys: Returns an Array with all the available Keys in Dictionary. Remove: Removes an item associated with specified key in Dictionary. RemoveAll: Removes item associated with all the Key from Dictionary. Here all the items have been removed, hence in message box values is showing blank.